Teaching at a research university, I see a slew of high-tech gadgets, or even low-tech ones, that we are asked to consider to enhance the educational experience of our students. As a broader theme, some technologies have been put up as disrupting the “traditional” college mode of education dating way back to the turn of the 20th century when with an efficient postal service, correspondence courses were meant to hold sway. Today, we hear of some nascent technologies that are poised to bring in such disruption in the near future. Here I look back at how technology has been poised to change education over the years and ruminate on how I see myself and my university faculty colleagues approaching classroom teaching and how I see our current students and future generations approaching higher education. Before launching into these points, I will say that these topics form part of a legitimate deep field of inquiry, with volumes of papers and books produced on it. So I mean this article to be a rather personalized view and not a rigorously grounded academic article. 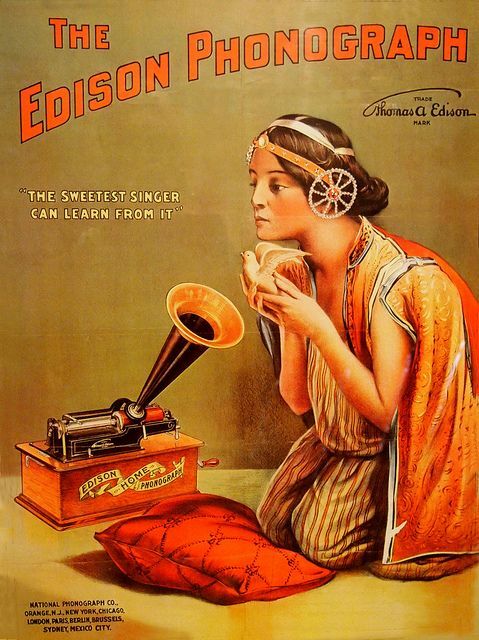 An early advertisement for the phonograph. The promise to seamlessly educate in all forms is plain. preserving the explanations made by a teacher, so that the pupil can refer to them at any moment, and spelling or other lessons placed upon the phonograph for convenience in committing to memory. Books will soon be obsolete in the public schools. Scholars will be instructed through the eye. It is possible to teach every branch of human knowledge with the motion picture. Our school system will be completely changed inside of ten years. He particularly thought Geography was a field ripe for educating through moving images. Having labored through Geography map lessons in my high school days in India, I would have raised a non-alcoholic toast to that sentiment. Television even before it became a must-have household item was supposed to change how we educate people. There was a movement called educational TV, a non-profit was formed that morphed into the Public Broadcasting Service (PBS) in the 1970’s. I love PBS and feel life would be so much duller without it, but I do not look to it to provide me with my dose of education, or, for that matter, education for any segment of the population. In the early days of the educational TV movement, if you got up bright and early at 5 am, you could catch an hour of illuminating foreign language lesson and then get ready for your school. Or see this wonderful display of distance education through television sets as done by an NYU professor back in 1938 before televisions were mainstream. One can argue that the plethora of education-oriented channels on television today have resulted in some of that vision coming to fruition. Think of The Discovery Channel, TLC, Animal Planet, Science Channel, … the list goes on. But, that education has mostly been of the informal kind, not providing the grounding in fundamentals, but rather providing easily digestible material in a universally palatable style. And our attention span when it comes to concentrating on material on television is notoriously low. So it is little wonder that television has not supplanted our traditional means of educating people. Learning at your own pace, or individualized instruction, was going to be the great benefit of using computers in education. Instead of the teacher in one large classroom with a large variety of learners and teaching to one amorphous median student, the computer lessons could be tailored to each student. A series of PLATO terminals at the University of Illinois at Urbana-Champaign around late 1970’s. These terminals were a precursor to online education. One of the early success stories came from my alma mater, the University of Illinois at Urbana-Champaign, from its Computer Science department. ILLIAC was the first electronic computer that was fully owned by an educational institution and was commissioned in 1952. Using the ILLIAC as a computational engine, UIUC faculty introduced PLATO, the nation’s first computer-assisted program of instruction. PLATO was the world’s first time-shared computer-based education system as well as the home of the first on-line community. By 1987, the PLATO network would offer more than 12,000 instructional hours in some 100 subjects to on-campus terminals and others scattered across the globe. One can argue that the wide availability of quality online content is a logical and successful progression of efforts such as PLATO. But think of the vast majority of the classes taught at a top college campus in the US. You will see a professor teaching a class standing in the front, assigning homework assignments, collecting them (electronically for me and most of my colleagues in ECE/CS), giving exams (paper-based ones for the most part), and grading them all. Sure there are several technology assists, some useful, some not so much. Examples of the useful kind are electronic bulletin boards where students can pose questions, multiple students can see answers posted by the professor, and discuss the material amongst themselves. Examples of the not-so-useful kind are online study aids (too variable quality, not enough resources spent in creating them) and interactive tools to keep the attention of the students in the class (but which often tend to fracture the low attention span even further). There won’t be schools in the future … I think the computer will blow up the school. That is, the school defined as something where there are classes, teachers running exams, people structured in groups by age, following a curriculum-all of that. The whole system is based on a set of structural concepts that are incompatible with the presence of the computer. In 1999, the nascent e-learning industry got into a huge tizzy of excitement when John Chambers, CEO of Cisco Systems made this bold pronouncement at Comdex. The next big killer application for the Internet is going to be education. Education over the Internet is going to be so big it is going to make e-mail usage look like a rounding error in terms of the Internet capacity it will consume. Doubtless we use computers in our learning and teaching process all the time. Preparing material for a class for me is done almost entirely through computers — researching material, collating material, (electronically) adding commentary and explanations, preparing slide decks, creating assignments, and so on. But the audience for all this is students that I interact with in person, in mid-to-large group settings (lecture rooms), in small group settings (tutorials), or one-on-one (working on problems together), rather than some amorphous unknown, and unknowable, blob at the end of an immaterial cyber connection. So Tell Me How Will My University Experience Be? I believe that the boring traditional form of university education will be with us for the long term. The flash-in-the-pan, purely commercial, make-a-quick-buck educational institutions will disappear or be marginalized (think of all the glitzy ads that you see for for-profit online universities), while brick-and-mortar universities that retool and deliver value for the education will thrive. Clearly (to me), a $50,000 per year tuition university system cannot continue to be the predominant mode of higher education. The economic pressures are too great in the unfolding age of stagnant or slowly rising median income in the developed world. The democratizing influence of content from around the globe will put pressure on that ivory tower education, as it should. But, the classroom experience will continue to be the foundation of a quality higher education — not an afterthought in a flashy education contraption, but the bedrock of it. Knowledgeable professors, passionate professors explaining the foundational concepts, discussing the latest developments, and critically analyzing the pros and the cons of the technological progress will be what will prepare our young minds to tame the complexities of our technological world. In this mode, there is space, make that the necessity, of teaching the principles that will form the lode star for our young minds to chart their journeys in uncharted territories. A brain scan that reveals the structures and signals that make you you. 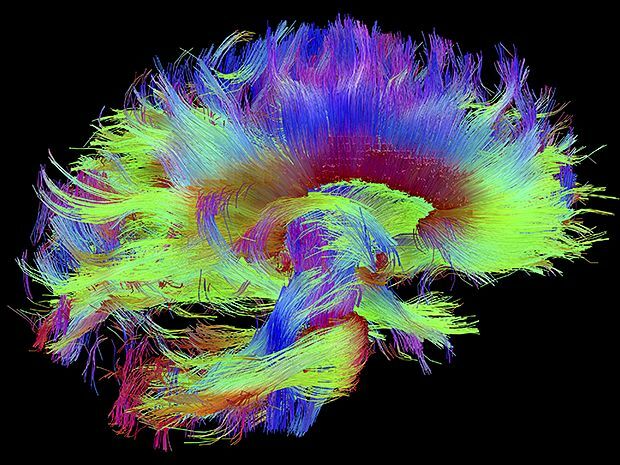 Image from USC Laboratory of Neuro Imaging/Athinoula A. Martinos Center for Biomedical Imaging/Consortium of the Human Connectome Project. I will add that you only have a 12 W appliance, of all of 86B neurons, to process it all. Our boring, traditional university education is needed for us to make the best use of this appliance and the two eyeballs. Posted in Academic Life, Technically Speaking. Tagged education, MOOCs, technology in classroom.